Numismatic Guaranty Corporation (NGC) authenticated and graded an iconic 1839 Victoria "Una and the Lion" gold coin. Widely considered to be the most beautiful British coin ever struck, the rarity was submitted by Baldwin’s of St. James’s, an English firm. It was graded NGC PF 65 Ultra Cameo, making it one of the finest known of the type. The coin’s obverse shows a beautifully executed bust of Queen Victoria by chief engraver of the Royal Mint William Wyon, who also designed and sculpted the reverse. The legend VICTORIA D: G: BRITANNIARUM REGINA F: D: surrounds the bust, Latin for "Victoria by the Grace of God, Queen of the British territories, Defender of the Faith." 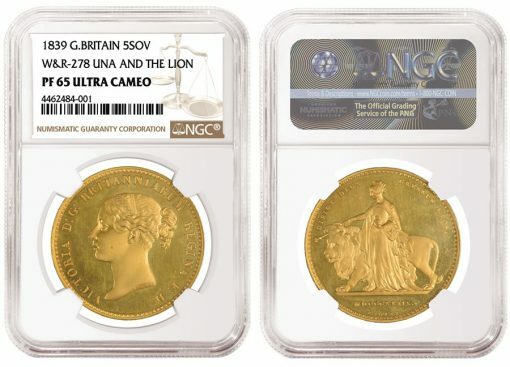 The reverse of the 1839 "Una and the Lion" Five is more famous. It again features Queen Victoria, but this time as Lady Una, a character from Edmund Spenser’s 1590 poem "The Faerie Queene." She is seen directing a striding lion with a scepter in her outstretched right hand, and is clutching a globus cruciger (a cross-bearing orb) in her left. The Latin motto DIRIGE DEUS GRESSUS MEOS, which translates to "May the Lord direct my steps," surrounds the iconic scene. Only around 400 examples of the gold coin were struck to commemorate the start of Queen Victoria’s reign two years earlier. The rarity of these pieces combined with their attractive design makes them among the most desirable and valuable coins in all of numismatics. This amazing piece of numismatic history highlights the Premier Coinex auction on September 22, 2017, in London by Baldwin’s of St. James’s.